In reference to the movie we watched this week, Sins of My Father, pick a victim’s point-of-view (POV) regarding the film, and address the attachment of meanings per this film for the chosen victim. Remember, there are many different kinds of victim’s portrayed in the film and pertaining to the issue of drug cartel terrorism. First come, first-served. I would prefer you all to choose different victims and different aspects of meaning related to the film’s communication efforts regarding drug-cartel terrorism. You can even pull in links to current mediated stories as this is an ongoing issue. Take time to research your POV and how you will comment touching on all three aspects of this comment. Your communication counts too! Sins of My Father illustrates the direct narrative documentary film style. The family provided archival photographs and footage to document the outrageous life of Pablo Escobar. This point of view is seen through the Colombian kingpin’s son, Juan Pablo; who changed his name to Sebastian Marroquin. Using the direct narrative, Marroquin connects with the audience showing his values and beliefs are separate from his father and his past. Others are interviewed but his point of view is the most interesting and powerful. What puts the power in his story is his wanting or needing forgiveness for his father’s sins. The south American culture follows the patriarchal social system where men have the greatest authority. Instead of following in his father’s footsteps, he has been an instrument of peace. Marroquin reached out to the son’s of two men that his father ordered assassinations of; former Justice Minister Rodrigo Lara Bonilla and presidential candidate Luis Carlos Galan. Beside these men, many unnamed victims gave up their lives by just being in the wrong place at the wrong time. According to Time, Escobar cost Colombia the lives of an Attorney General, a Justice Minister, three presidential candidates, more than 200 judges, 30 kidnapping victims, dozens of journalists and perhaps 1,000 police officers (Retrieved from “Tales of the Drug Lord’s Son”, TIME. Retrieved on March 9, 2014). I believe the Colombian Society as a whole is victim of Escobar. When he entered politics and was challenged by honest men, he killed them. It was believed he had influenced a constitutional change to fit his needs. But the biggest influence was on the poor. He worked hard to cultivate his Robin Hood image, and frequently distributed money to the poor through housing projects and other civic activities, built sports arena, hospitals, schools and churches (Retrieved from Pablo Escobar on Wikipedia on March 16, 2014). This brought Escobar “Hero Worship” from the poor and their protection of him. Escobar brought unsurpassed violence and a government that could be bought. Even though Escobar helped the people of Columbia, his legacy is rooted using and abusing his power that made him one of the richest men in the world. Unfortunately, the average Columbian’s frame of reference of Escobar is that of a man that supported the people. After carefully watching Babel and taking insightful notes on the film’s context, differing ideologies and political infra-structures (hegemonic influences), please list only one example from the film of a particular cultural stereotype. Then, discuss how this example you chose might have (potentially) been received by an American audience versus the actual same ethnic/culture audience the incident took place (in the film). 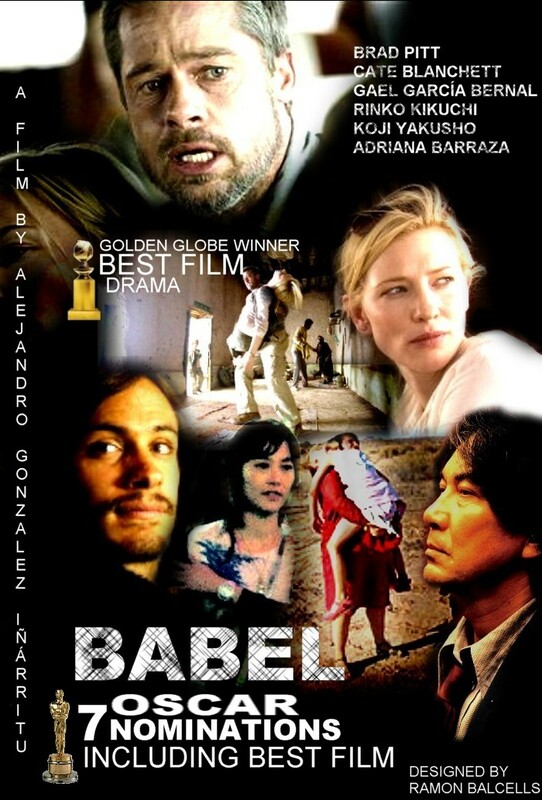 Babel’s plot is dispersed among several countries and portrays the characters in a way that illustrates how global communications is flattening our world.This film is truly an international work, from the production people to the writer and the cast.This film examines the varying perspectives of the characters in the aftermath of a tragic accidental shooting. I will focus on the Japanese character, Chieko. She is the daughter of the hunter, who gave the rifle to his former guide in Morocco. The emotionally challenged deaf/mute teenager has recently lost her mother to suicide. This character expresses her grief through extreme sexual acting-out. Another frustration relates to hegemonic attitudes of the hearing teenage boys that hang out where she does. I will focus on the scene in which she enters the disco with her girlfriends and the new acquaintances. These new acquaintances have fed the girls whiskey and mind-altering substances. This forges instant friendships. Chieko feels accepted in this group. One of this guys, Haruki, shows an instant attraction to her. The sequence leading to the entrance of the disco shows the fast pace of Japanese culture through fast-moving citizens, subway, wide-shot of the busy streets and her drug-induced enjoyment of the simple things in life, like swinging and playing with the boys in the water. For once in the movie, Chieko is enjoying life. Haruki has his arm around her and she can sign with him. The Japanese teenager enjoying herself. The scene’s music transition before they enter. Shot of the subway, travelers, and the chaotic motion of the traffic segue into the bright lights, lasers, smoke and the mass of bodies dancing. Haruki takes her purse and stuffs it into a locker and drags her to the dance floor. September/The Joker by Fatboy Slim is moving the crowd. The audience hear what she hears intermittently. NOTHING. At first she seems overwhelmed but finally she smiles. She observes the people around her. She feels the energy and starts mimicking the movements of dancers. The audience can see her self-confidence and she laughs for the first time in the film. Unfortunately, this feeling does not last long. The composition of the shots range from extreme close-ups of Chieko, unfocused features giving the effect of the drug wearing off and the crowd enjoying themselves. As the song changes, Bootsy Collins can be heard making the statement, THE JUNGLE S GETTING WILD, BABY. This is the counterpoint of the scene. The music speeds up, the composition of the shots get weirder and she shuts her eyes closed for awhile. When she opens them, she notices her girlfriend and Haruki making out.Her smile disappears and she stops dancing. Once again the audience experiences her auditory POV, no sound. She waves and leaves. From my experience, I can say that she was more depressed and confused than before she took the drugs. I believe that Chieko represents a stereotypical teenager, in either America or Japan culture. I understand these two cultures are different. In my opinion, all teenagers want acceptance from their peers and feel self-confident. As far as audience reception of this scene, I believe that the impact has to do with experiencing the disco through her perspective of silence. I would guess that most of the audience, either Japanese or American, have not experienced a silent disco. Explaining China‘s Mobile app ecosystem: the potential, players, and pain points. 500 million smartphones that’s still improving. “90%+ of those consumers are upgrading to entry-level Android smartphones…” Developers must remember that these devices capabilities trail behind US and UE counterparts; developers must remember to optimize for this relatively low-end Android market. Hundreds of app stores, but about 20 major players. Focus on only on China’s very largest app stores with the greatest distribution efforts. Arai recommends international concerns work with a third-party company with a local presence in China who understands these idiosyncrasies. Many app stores means many approval and billing processes. Each store will require different QA and certification processes for each, along with vastly different revenue splits — QQ for instance takes up to 70% of an app’s revenue, while China Unicom takes 30%. App creators must track not only the performance of their app, but also the current standing of the app stores. This market moves extremely fast and one can find themselves trailing rather quickly. There’s App Store life beyond games. China is seeing a number of other app varieties beginning to gain , like educational apps and basic utilities, especially those which enable sharing of audio, video, and images, attracting substantial downloads. Major players dominate China’s app market. These major players only cater to the proven audience and established app categories. The Chinese app world is open to many categories and audience considered niches or have not been explored, like exercise and educational. Arai strongly recommend that your app come with deep social network integration with China’s top social networks to increase the chances it will find the audience it deserves. Pain points besides piracy: First, the Chinese government will tax whopping 30%. Then publishing an app requires cloud services backend support; which means using an operation within China. Cloud and servers beyond the Great Firewall will suffer connectivity issues. Masanari Arai is founder and CEO of Kii, an international MBAAS with a presence in China. Masanari has more than 15 years experience in mobile software in Silicon Valley and Japan. He joined Intellisync in 1995 as one of its original members, where he served in various positions, including VP Product Marketing, VP Business Development, GM for Asia and President of Intellisync Japan. Prior to Intellisync, Masanari was at IBM where he was the product manager of the original ThinkPad 700 Series. This is already a great year. After completing 15 hours, I will graduate with a Bachelors of Science from the University of Houston in Digital Media. I plan to share on regular basis and build my brand here on WordPress. So look forward to informative information on design principles, examples of my work and links to cool stuff I have found.